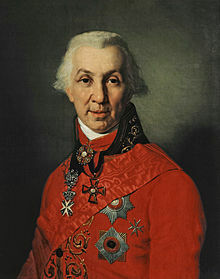 Gavrila Romanovich Derzhavin (Roushie: Гаврии́л (Гаври́ла) Рома́нович Держа́вин; 14 Julie 1743 – 20 Julie 1816) wis ane o the maist heichly esteemed Roushie poets afore Alexander Pushkin, as well as a statesman. Awtho his warks are tradeetionally conseedert leeterar clessicism, his best verse is rich wi antitheses an conflictin soonds in a wey reminiscent o John Donne an ither metapheesical poets. This page wis last eeditit on 26 Mairch 2017, at 00:45.